Discussion in 'Knife Reviews & Testing' started by kozzman555, May 29, 2018. My apologies if this is in the wrong forum section. If it is, please feel free to remove or delete and point me in the correct direction. Anyway, I heard a LOT of great things regarding LT Wright, so I checked them out. Lo and behold, their Large Northern Hunter caught my eye. I really like this design, kept reading amazing things about the AEB-L Stainless steel it's made of, and the price range is fantastic. I guess the one thing that's holding me back is the complete lack of customer reviews for this knife. I found one single review of the Small Northern Hunter on Reddit, but that's pretty much it. Does anyone here have a short review or recommendation for this knife that owns/uses it? I plan on using it as a bushcraft/skinning/all around small task knife to go along with my Condor K-Tac Kukri when I'm out camping. I apologize for the request, but I am really hesitant to buy knives without really researching them first. I have two. One that is saber ground and the other is flat ground like the one in your photo. Its a great all around design. The handle is very comfy. Mine came very sharp. I wish they were in3V steel as its my favorite steel. AEB-L seems to be fine for what I have used it for. Mostly kitchen stuff and I cleaned some ducks that I killed last hunting season. 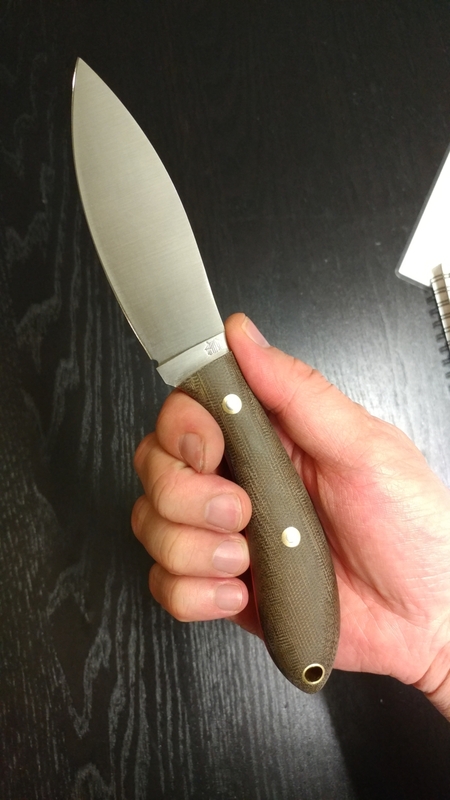 I havent really put it to use as a bushcrafty type blade yet. Thank you for the feedback, Riz. I appreciate it. I guess I might have to snag one and starting beating on it and see how it holds up and let everyone know. I dont think you will be dissappointed. Check your profile. I left you a message with a link to the exact Northern Hunter that I own. Mine just arrived today - have to say I am impressed. 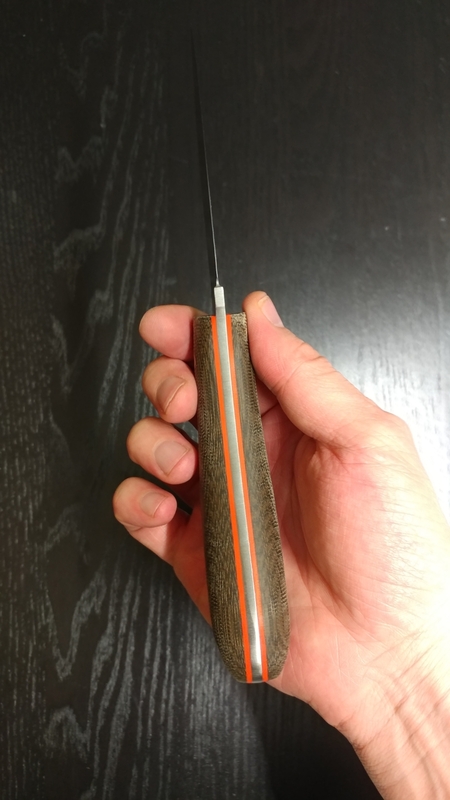 I got the matte green canvas micarta with orange liners. Handle is fantastic, very comfortable, countoured, little bit grippy and MUCH better than the Bark River Aurora LT I just bought recently. Only did a little bit of cutting but the edge is definitely aligned to being a food prep and skinning blade... I'm sure it will hold up to a little batoning, but this is where the Aurora will win out. The spine was squared (if you like that.) The lanyard hole tube needed a minute of sanding as it was sharp. It is more handle heavy than the BRK Aurora LT - but they both weigh exactly 5.9oz. Steel is AEB-L Stainless - it's not Elmax but it's apparently as tough as 52100 with greater edge holding. I don't baton often so the Large Northern Hunter is a keeper for me. Dangerously and kozzman555 like this. Thank you, Daniel! This is pretty much the knife I think I've been looking for. I think your review has tipped the scales for me, and I'm definitely going to be picking one up!